What is Himalayan Salt or Halotherapy? It is a gentle and simple way to achieve deep relaxation, meditation, wellness and centered-ness. To put it simply, Halotherapy is salt therapy! The modern Micro-climate, with a relaxing ambiance, low temperatures, high levels of moisture, and iodine dispersed throughout the room, a Halotherapy Session begins. The Healing Salt room/cave was designed to mimic the atmosphere of Polish underground salt mines, where the idea of Halotherapy originated. 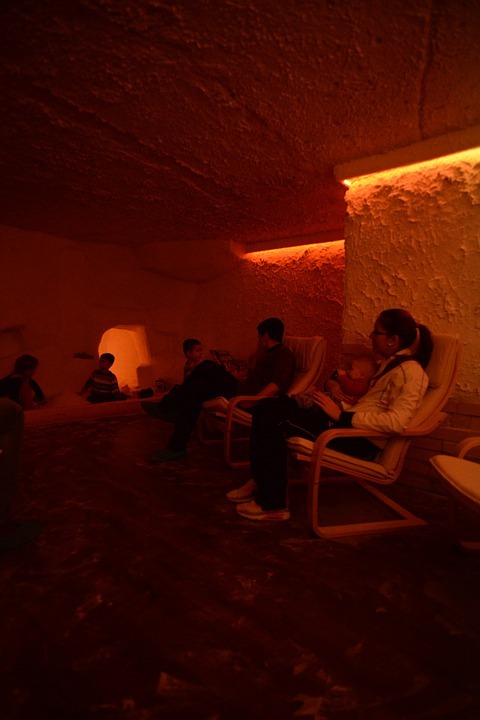 The salt room uses state of the art technology to reproduce the atmosphere of the salt caves or in special mines, and has a monitored therapeutic micro-climate. The walls, floor and ceiling are covered with numerous layers of salt and halogenerators which ionize and saturate the air with a natural substance of Himalayan rock salt. Himalayan salt room/cave therapy have been recommended for possible health benefits due to increased negative ion count in the air around you. Negative ions can help you feel tranquil and relaxed. Negative ions are oxygen molecules with a negative charge, that negative charge allows you to take in more oxygen, about 20% more. We all have electromagnetic frequencies (EMF) bombarding us on a daily basis, the air we breathe, the food we eat, and the water we drink. While we cannot hope to hide from them, having a Himalayan salt treatment can help to alleviate symptoms such as asthma, allergies, fatigue, headaches, problems sleeping, etc. With 12 tons of Himalayan pink salt covering its walls and floors, our salt room/ cave is like nothing you’ve seen. Patients/clients/guests are seated in reclining zero-gravity chairs and encouraged to focus on deep breathing while a Halo-Generator disperses sodium chloride into the air and soft music plays. Blankets are provided, as the cave is kept at 18-20 degrees to recreate authentic salt mine micro-climates found in Europe, as well as to banish bacteria (a UV light is also employed to this end). Respect the no-talking rule to ensure relaxation and enjoyment, and drift off to the sound of iodine-saturated water flowing from cascades. Halo-therapy improves congestion, chronic coughs, respiratory ailments, sinus infections, allergies, insomnia, skin conditions, and immunity. Whether you're looking for a meditation aid or just want to boost your energy and feel better, Empress Health and Wellness Centre has the perfect salt therapy solution for you. Guests to Empress Health and Wellness Centre’s Himalayan salt room/cave halotherapy treatments will be asked to fill out a waiver outlining the reason for their visit (i.e., allergy symptoms), and our specialists then recommend a particular number of Halo-therapy treatments that will be needed to alleviate the concerns, as well as provide a full background and explanation of the treatment and its origins. The session is 45 minutes long and you’ll be provided with a blanket and told ahead of time to dress comfortably and in warm clothes, as the cave is kept cool. You are welcome to bring books as there is a no-talking policy. Undergo regular salt cave halotherapy in Empress Health and Wellness Centre, or else choose to go for one combined with a infrared sauna salt therapy, meditation, massage therapy!